The instrument was originally installed in the Granada Welling, in South East London, which opened on the 22nd November 1937. 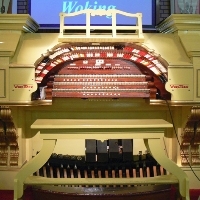 Since August 1995 the Wonderful Woking Wurlitzer has been entertaining people not only from Woking and the surrounding area, but further afield and abroad. It is regarded as one of the best Wurlitzer organs in the UK. We hold regular theatre pipe organ concerts on the instrument, which is installed in the Wurlitzer Hall at Woking Leisure Centre. The shows feature music for everyone played by international theatre organists. For further details on our concerts please visit our website, the details are below. We need local volunteers who can help with the charity's adminsitation and public relations, as well as people who can help set up and clear away after the regular concerts at Woking Leisure Centre . If you think you can help, or wish to learn more, please contact us via our website. This is the perfect early Christmas present for all the family, carefully timed to fit inbetween your morning activities or appointments, and perhaps an evening Christmas event or must see TV. The Wurlitzer Hall will be beautifully decorated for the show, with the Wonderful Woking Wurlitzer the centre attraction, but complimented by special guests.